The Memonic Web Clipper lets you capture content snippets on any web page. Click the button, then click "Add Bookmark" and click "Save". Click the button and tap "Edit" in the upper right hand corner. Tap "Memonic" in your list of bookmarks. 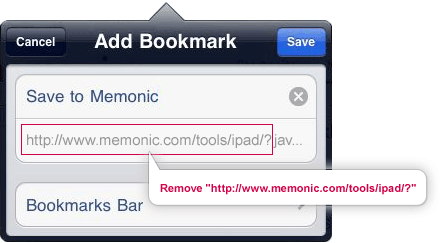 To use our Web Clipper on this or any other page, tap your bookmarks button and choose "Memonic". To have your bookmarklet available at one click, open the Safari Option in the iPad Settings and set "Always Show Bookmarks Bar" to "ON". Now move your "Memonic" bookmark to the bookmarks bar. To select any paragraph or image, tap once to lace the red border around it and then a second time to highlight it. 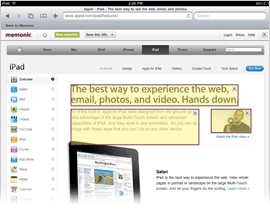 Would you like to have one-click bookmarklets for each of the features the Memonic Bookmarklet offers? Lucky you! Find the one-click bookmarklets below and add them as described above. Want to access your notes while offline? Install our iPad/iPhone Application.